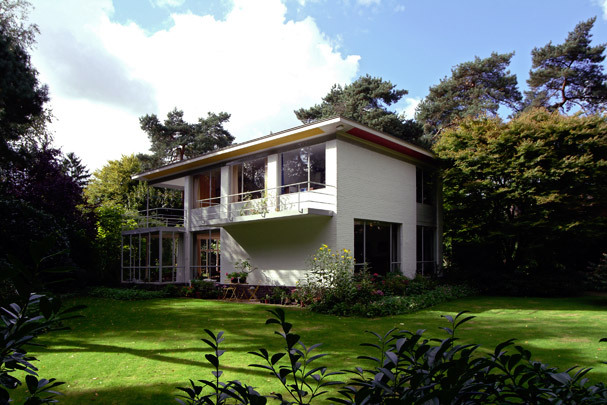 In the 1930s, the architect Piet Elling (1897-1962) designed three free-standing residences in Hilversum. The Liebert House was commissioned by the director of Radio Holland. It combines a main block for living and sleeping with a less-tall block of garage and storage space. In-between the two are the entrance, staircase and flue; the terrace and balcony assemble in a roofed area at the back. This was the first building in which Elling, a great admirer of De Stijl, used an interior colour design by Bart van der Leck in a synthesis of architecture and art, with patches of red, yellow and blue on the walls and ceiling of the living room.See also private house Doyer and private house Polak in Hilversum.